Miss Tilly And Me: To primary school or to home school?? 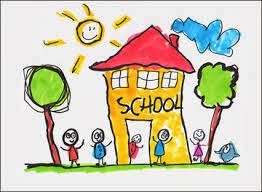 To primary school or to home school?? She will be four in march and i have tried to get my head around her going to school but i just cant. I thought about keeping her home until she is 5 in march 2015, but then she will enter a class where friendships are already made and she will struggle to fit in, plus she will be behind on her school work and development. So here i am having to choose where to send her, i know that i can send her to the school a 15 minute walk away but the older ones went there and kimmy had dyslexia that the school didn't pick up on and they basically wrote her off and told her not to bother with grammar school, but she passed the exams to go there and got dyslexia support and passed her Alevels getting As and Bs. She is an amazing girl. she then went on to uni. Since my older kids went there, the school failed an ofsted and was put into special measures, it is out of it now and a new head is in place and some new teachers are in place, but it is niggling at me.